Jacmel, Haiti (CNN) -- Tuesday morning, Joachin "Clark" Jean-Gilles was a millionaire. Tuesday night, he was sleeping in his car. Jean-Gilles was owner of the Peace of Mind Hotel in Jacmel, Haiti, a three-story, 30-room hideaway in a quiet tropical valley on Haiti's southern coast, 25 miles from the bustle of the capital, Port-au-Prince. Jean-Gilles and his wife, Marie, lived in an apartment on the property, close enough to watch carefully over the guest rooms, conference rooms, boutique and restaurant, close enough that they pledged to know the first name of every guest. After the 7.0-earthquake hit, they slept in their aging Isuzu, parked in the hotel driveway. Jean-Gilles figured a split second was the difference between life and death when the temblor struck. He was working in a ground-floor conference room and first heard, then felt the quake. He asked his electrician, Roberne St. Louis, who was working nearby, what was happening. "Get out. Now. Get out. Now," St. Louis said. Jean-Gilles cleared the collapsing structure by a mere second, he estimated. His wife, who was working in the couple's apartment on the second floor, wasn't able to get clear. People nearby heard her screams after the shaking stopped and removed the cinder blocks entrapping her by hand. She was shaken and scratched, but walked away from the wreckage. "I am alive. God is good," she repeated over and over on Saturday. The Peace of Mind Hotel was a dream come true for Jean-Gilles, 57, and Marie, 59. Born in Port-au-Prince, they moved to the United States shortly after meeting 34 years ago. Together, they owned a beauty supply store in Jersey City, New Jersey, and invested in real estate. In 2003, they cashed out their U.S. investments, returned to Haiti and began building the Peace of Mind Hotel, looking to make a future for themselves and the people of their homeland. "In a country that is so poor, we knew we could do well. We could help people by creating jobs," Jean-Gilles said. They did just that. The Peace of Mind, which they valued at about $2 million, was theirs free and clear. They employed 40 people during the construction and had 25 on staff when the quake struck. One employee, who is also a relative, was killed in the collapse. Her body was retrieved on Saturday. One other body remained in the rubble of the Peace of Mind, that of an American working in Haiti who'd stopped in for a few drinks and to use the Internet. Heavy machinery pulled away chunks of debris and the smell said searchers were close to finding that body, too. The couple's relatives in the United States didn't learn of their survival until this story was published on CNN.com. A relative saw the couple's picture on CNN.com's homepage and told others, said the couple's daughter-in-law, Karen Jean-Gilles of Fort Lauderdale, Florida. She said she and other relatives were going crazy with worry until they saw the picture. The relatives in the United States still haven't been able to reach the couple, but Karen Jean-Gilles' husband plans to go to Haiti and find them as soon as commercial flights resume, she said. "I was crying. I was just so happy that they are OK," Karen Jean-Gilles said Sunday evening. " As for the hotel, while business wasn't overwhelming during its first year, hope was high for February, when the annual carnival celebration brings thousands of people to Jacmel. Business in Haiti relies a lot on hope. There is no insurance for small-business men like himself, Jean-Gilles said. And he'd yet to find international insurance since he opened the hotel last February. He'd worked six years on it and invested a lifetime of savings. Saturday, Jean-Gilles said he wanted to rebuild, but was at a loss on how he could make that happen. "We don't have a source of revenue. This hotel was the source of our revenue. All we've worked for our whole life. And it's gone," he said. Still, he tossed around options. An outbuilding that served as a kitchen survived. Maybe he could build around that. And there's a swimming pool that was just about complete. That was something to work with. And there was the hope and faith that had let him live his dream, if only for a few short months. "God is good. 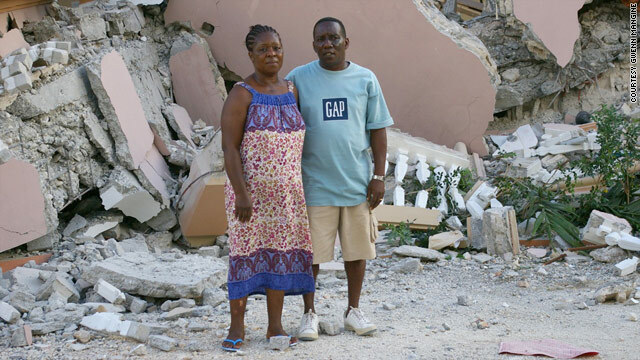 Remember, God is good," Jean-Gilles told a neighbor in the valley as he contemplated rebuilding. "This time it will be flat. I am not building up anymore." Karen Jean-Gilles said her father-in-law and mother-in-law spent their life savings and did "everything they could possibly think of doing to get this hotel up and running." Clark Jean-Gilles looked at the hotel as "being the legacy to his grandchildren," she said. "I'm just so happy that they are OK, but I'm sad about the hotel," Karen Jean-Gilles said. "We don't know what they're going to do now. My husband wants to get to Haiti to help them, but the airlines are closed. So, it's really complicated, but we're just thankful that they're alive." CNN's Don Lemon and David Williams contributed to this report.